Hey there, thanks for checking out my page. I’ve been playing the guitar ever since I finished junior high school. I got an acoustic guitar and was completely hooked. In addition to playing guitar, I also thoroughly enjoy playing drums. My deep passion for music lies with songwriting. I absolutely love composing music. Stylistically, I usually tend to write heavy music mixed with modern and classical soundtrack elements. I love the raw power of metal, and I love the majestic beauty of soundtracks and scores, and blending those two styles together is musical heaven to me. I also really enjoy dabbling in the world of electronics and synths. Some of my favorite artists include: Hans Zimmer, Periphery, Muse, Celldweller, Two Steps from Hell, Born of Osiris, Threat Signal, Soilwork, Extol, Dream Theater, Symphony X, Alter Bridge, Demon Hunter. 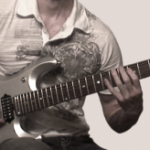 I truly hope you enjoy and benefit from my guitar lessons here. Music is a journey, have fun with it!